It does noÂ’t take long for children and/or pets to become overheated in a car, even on a mild day with the windows cracked open. In fact, even if it is in the mid 70Â’s, the interior of a car can quickly climb to over 100 degrees or more minutes. And while many of us have all either been left in cars to wait for our parents while growing up, or have left our own children or pet sitting in a vehicle while we ran into a store Â“for “just a minute”Â” without any serious consequences, it is important to remember NEVER to do it! Keep in mind that an average of 38 children, most under the age of two years old, have died from heatstroke each year since the late 1990Â’s after being trapped inside an overheated vehicle. In fact, it should be noted that a child’s body temperature can Â“rise as much as five times faster than an adultÂ’sÂ” in the same situation. As the temperatures climb inside the car, the extreme heat can cause a child to exhibit the following symptoms: Leg and/or stomach cramps, hot, red, dry skin but no sweating; rapid pulse, headache, vomiting, dizziness, irritability, rapid, shallow breathing, confusion, lethargy, and at worse, unconsciousness or even coma. If you do find a child in an overheated car, remove them immediately and place them in a cool, shaded spot, or get them into an air-conditioned room as fast as possible. Fan them and remove any excess clothing. If possible, apply cool water to their heads, back of the neck and wrists. Even better, immerse them in a tub or pool of cool water. However, be sure that the water is not too cold, as this may actually cause the child to start shivering, which in turn can raise their temperatures even higher. If the child is conscious, be sure to give them water to drink (slowly), and keep their feet elevated. In extreme cases, call 911. Note: Readers who leave their dogs in locked cars while they run errands during the summer need to keep a close eye out for signs of heatstroke or stress. If the dog is panting heavily, salivating or foaming at the mouth, get him to a cool place quickly and place ice on the pads of his paws, as well as on the back of his head. Also provide small sips of cool water. If you do not see any improvement after a few minutes, call your vet. Wear and tear on our vehicle’s interior starts long before we even realize the damage is being done. This is especially true when taking those long road trips. You know the scenario: You return home from a fabulous summer vacation. When you unpack the car, you realize it looks as if you have been on the road forever. Between wear and tear and food and drink spills, the car seats look like theyâ€™ve been run over. If you are anything like I am with my “baby,” you must clean it up, right away! Before permanent damage sets in. But where do you start? The leather experts from Fibrenew, a leather, vinyl and plastics refurbishing specialist, provide a few tips for car owners about how to handle the Top Vacation Roadtrip Spills. Below are The Doâ€™s and Donâ€™ts of Road Trip Clean Up. According to Michael Wilson, CEO of Fibrenew, â€œOnce the summer vacation season kicks off, we receive a lot of calls from car owners wondering what can be done about the damage to their leather and vinyl seats.â€ Drivers and passengers alike are often not very successful at trying to juggle food, drinks and toys on the road. The worst problems are caused by car owners who donâ€™t know the best ways to clean up a mess and repair a problem. Before you pack the car for your trip, it is a good idea to clean and protect the seats. Dirt, oil and dust don’t do any favors to leather and vinyl seats, and act like a fine sandpaper, slowly wearing down the vinyl and the protective coating on the leather, making them more susceptible to damage. Once the surface is weakened, leather and vinyl is more likely to crack and fade and it wonâ€™t hold up well to everyday wear and tear. Therefore, it’s very important to purchase a good leather or vinyl cleaning kit, which include leather/vinyl cleaning and protection cream, or just a cleaner. Applying these creams or cleaners before you make your trip is a good way to prevent damage to leather or vinyl surfaces. It will also save time and money later on; that is, of course, if you care about maintaining your vehicle’s interior. Bring along an absorbent towel or two, as well as one or two rolls of paper towels. 1) FOOD OR DRINK STAIN: Passengers-or the driver-eat a pizza slice or burger and only part of it lands in the mouth, the rest goes you know where: on the car seat. The drink follows. AVOID using window/mirror cleaner because it contains alcohol which will dissolve and destroy the surface coating on your leather. DO use a damp towel to wipe up the mess and a dry one to finish the job. Fully-finished leather is pretty much water resistant, so a little spill isnâ€™t going to hurt as long as you clean it up quickly. 2) INK: The use of bright markers gets on the corner of the car seat. DONâ€™T use dish soap or hair spray to remove the marks. The degreasing agents in dish soap can permanently de-gloss and damage the top coating on the leather surface. Hair spray, another commonly recommended remedy, has alcohol in it and will ruin the surface coating on your leather. DO use a soft sponge and specialized leather cleaner. 3) NAIL POLISH: AVOID using nail polish (or remover) in the car because it will take all of the color out of your leather and leave a bleached spot bigger than the nail polish spot. Instead, use a soft sponge and leather cleaner. However you will most likely have to call a professional for help to get rid of this stain. 4) ANIMAL SCRATCHES AND PICKS: DONâ€™T touch up the spots with shoe polish or markers because it makes an ugly, sticky mess. Rather, DO try to reduce the visibility of the problem by snipping off the cotton interior strands that often get pulled out when leather gets picked. DO use a hair dryer and massage minor scratches with leather cleaner to try to rub it out. Call a professional to fix larger scratches and holes – this is not a DIY kind of job. Once you return home, clean out the car, especially if you have been at the beach. The sand and salt from the beach can not only damage your leather and vinyl seats, over time it will be ground into the carpet and become almost impossible to remove. That means the salty sea smell will stick around, too. Use the leather cleaner on the seats. In most cases, a good vacuuming will remove the sand and salt. If sea water has landed in the car and really soaked the carpet, it might be wise to get the carpets washed. May 7, 2012-A new series slated for first-run distribution on the Internet-â€œCar E.R.â€- is based on Pam Oakes, Fourth-Generation Mechanic & Owner of Pam’s Motor City in Fort Myers, FL. Oakes Entertainment and Pamâ€™s Motor City are proud to announce â€œCar E.R.â€, a new reality series starring Pam Oakes and the employees of Pamâ€™s Motor City in Fort Myers, Florida. Sponsored by AC Delco, â€œCar E.R.â€ follows Pam, Peter (her long time fiancÃ©) and the rest of her gang at Pamâ€™s Motor City as they deal with tricky automotive repairs, esoteric customers, and serious attitudes within the shop. Of course, not everythingâ€™s a problem, and thereâ€™s a lot of fun and good times, too. Unique to this series is that Pam owns and operates the repair shop, day in and day out. Not many women dare to venture into this highly male oriented field of work, but Pam follows in her fatherâ€™s footsteps, and gives the boys a run for their money. They better pay attention when she talks, because she owns the shop! To see the first few shows click on www.car-ershow.com, and connect with the show on Twitter @CarERShow and Facebook. Pam is also the author of Car Care for the Clueless: Successful Used Car Buying 101. Unfortunately for the Suzuki Kizashi, itâ€™s a vehicle that is largely unknown. Which is a loss for most car shoppers who are in the market for a sporty, attractive and well-put together four-door sedan. It is not a stretch to compare some of Kizashiâ€™s attributes with German-made vehicles, such as its upgraded interior. Available in several different trim levels, the Kizashi can be had in 11 different versions. Overkill perhaps, but differences include mostly drive trains and all-wheel or front-wheel-drive figurations. Beginning with the S, front-wheel-drive (FWD), (manual and CVT), the Kizashi models descend as follows: SE FWD (CVT), SE Leather Edition, FWD (CVT), Sport GTS FWD (manual, CVT), Sport SLC FWD (CVT), Sport SLS Navigation Edition, FWD (CVT), S AWD (CVT), SE AWD (CVT), SE Leather (CVT), Sport SLS AWD (CVT), and SLS Navigation Edition AWD. Wow! 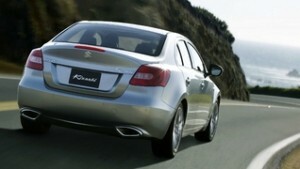 Interior room and fit and finish are above average in the 2012 Suzuki Kizashi. Steering is firm and nimble, and makes turning easy. One may experience some understeer due to Suzukiâ€™s all-wheel-drive, but for the most part, this quick, peppy sedan is a firm, comfortable speedster. While this writer found the seats to be a little less supportive than anticipated, the driverâ€™s seat does have lumbar support to ease a tired back during long distance drives. Some readers may remember the Super Bowl commercial with the Eskimo and his sled dogs. The scene opens with the dogs and their sled, then finishes with the Eskimo coming home to the igloo, with dogs in tow (lined up across the back seat! ), in his new Kizashi. If the Kizashi has any faults, it is the ability to fly under the radar, which isnâ€™t a good thing for Suzuki. But those who are enthusiasts are certainly aware of its merits, and are generally appreciative of its handling. And, the Kizashi does turn heads with its attractive front grille and sculpted exterior. One gets the feeling that this is a well-built sedan with best-in-class performance and respectable fuel economy at 22/29 mpg. Safety features include 2014 NHTSA front, side and rear crash compliance, Electronic Stability Control, Traction Control System, Bosch ABS and eight standard airbags-duel front facing, front side seat mounted, rear side seat mounted and front and rear head curtain. A tire pressure monitor and keyless entry add to the security features, as does a vehicle immobilizer. Suzukiâ€™s TouchFree Smart Key is a keyless start/stop push button ignition feature with just a fob to lock the vehicle. Drivers will enjoy dual zone climate control with vents that donâ€™t blow right at you. The sport seats in our test vehicle were premium cloth, with a 10-way driverâ€™s power seat with lumbar/memory, a leather tilt/telescoping wheel with audio and cruise controls and heated outside mirrors. The sport GTS features on the Suzuki Kizashi include a power tilt/slide sunroof, front fog lights, 425-watt Rockford Fosgate CD audio with 10 speakers, iPod and MP3 USB port, and the Sports Package which includes sport aero body kit, light weight sport wheels, sport tuned suspension and sport design steering wheel. The IP in the Kizashi is sporty and attractive, although not the easiest to read. And although not necessarily a fan of paddle shifters, the Kizashiâ€™s seemed a little smoother than some weâ€™ve tried. Options on our test vehicle included Premium floor and cargo mats ($210), Premium Metallic Paint ($130), Bluetooth Hands Free calling w/wireless audio streaming ($250), and Trunk Sub-floor organizer with first-aid kit ($65). Those in the market for a good-looking, sporty and fun sedan need to check out the Suzuki Zizashi. You wonâ€™t be disappointed. EPA Fuel Economy: 22/29 mpg. Warranty: 3 yr./36,000-mile Basic; 7 yr./100,000-mile drivetrain; 3 yr./36,000-mile roadside assistance; 3 yr./Unlimited Rust. As sport-utility vehicles go, the Mitsubishi Outlander Sport doesnâ€™t necessarily stand out; short of some innovative features such as the Music Server, which I discovered, makes a copy of your CD once it has played. This writer kept thinking the CD was stuck, but it wasnâ€™t in there at all. Once I had played it, a copy was made. Cool. Our test Outlander was the Sport ES model, two-wheel-drive, equipped with Mitsubishiâ€™s 2.0L MIVEC engine. While not a bad vehicle, when you put the Outlander up against such competitors as the Kia Sportage, Nissan Rogue, Toyota RAV4 and Hyundai Tucson, the going gets tough. We like the Outlanderâ€™s exterior styling and while it doesnâ€™t necessarily stand out, itâ€™s pleasing. With an MSRP between $18,795-$23,295, the Outlander is available in three trim levels: ES 2WD, SE 2WD and our test vehicle SE AWC. The All-wheel-control version is the top-of-the-line at just over $23,000 and equipped with the usual amenities: A/C, heated sideview mirrors, auto on/off headlights, leather-wrapped steering wheel, shift knob, keyless entry, power door and tailgate locks/windows/mirrors, rear privacy glass, Electronic Brakeforce distribution, ABS and driver knee airbag, side curtain airbags, advanced dual front airbags and front seat mounted side airbags. The only option the Sport ES had was the Navigation System Package which includes a 400 GB nav with music server and real time traffic ($2,295). The sound system, including AM/FM/CD-changer/MP3 with four speakers has decent sound. Although a quiet and smooth-riding vehicle, the Mitsubishi Outlander seems somewhat dated compared to recent updates in its competitors. However, this writer found the ride in the Outlander to be more accommodating than say the Hyundai Tucson or Kia Sportage, which both have a harder ride. The cabin is quiet and the engine non-intrusive. Styling of the 2012 Outlander is an improvement, with an edgy backend and aggressive front grille. One of its key features is the rear LED combination taillights. An available panoramic glass roof with LED mood lighting is a nice extra, as is the AW Control, super wide range HID headlamps, a 710-watt Rockford Fosgate sound system. The standard FUSE hands-free link system will appeal to those who feel the need to be connected at all times. Visibility is good in the Outlander. There is enough clearance between headrests and the vehicleâ€™s ceiling so that viewing out the rear window is unobstructed. Rear seating is average with not a lot of extra legroom. Cargo space is adequate yet donâ€™t expect to be hauling any large items. Controls are easily reached but seem somewhat dated. Fit and finish could be better and materials a little higher quality. While a nice vehicle, the Outlander wonâ€™t stand out. Pricing although fair, may not be a reason to buy it. EPA fuel economy: 24/31 mpg. Available in two five versions (DE, ES, GT, Ralliart, SE), the Mitsubishi Lancer has a select following; most seem to gravitate toward the carsâ€™ potential for modification (Ralliart, GT). Our driving impressions were very favorable for the new 2012 Lancer SE, a very comfortable, quiet-riding compact sedan. Equipped with the optional Navigation System Package, including the music server and real time traffic, the Lancer has a solid feel, takes most road surfaces very well and is roomy enough for all shapes and sizes. Edmunds.com has named it a â€œTop Safety Pick,â€ and a sporty alternative to other sedans. While maybe not as â€œrefinedâ€ as other competitors, Lancer has come a long way from a not very impressive 4-door sedan to one that offers more for 2012. Our test Lancer SE (starting at $20,195) falls behind the sportier Ralliart and GT models and shares the 2.4L engine with the GT. Versions DE and ES come equipped with Mitsubishiâ€™s 2.0L MIVEC engine, and an available third engine, the 2.0L turbo. We found the 2.4L with 168 horsepower to be sufficient and responsive enough for most driving. For 2012, the Lancer receives a few upgrades, including soft-touch materials on the front door panels, a rearview camera (on upper trim models), and minor interior and exterior changes. The new interior materials help to give the Lancer a more solid, upscale feeling, in contrast to the plastic in previous models. The SE trim level offers buyers a selection of midrange engines and all-wheel-drive (AWD). In previous years, AWD was only available on the Ralliart version. The SE trim gets the more powerful engine, all-wheel-drive and the Alloy Wheel package. Our test SE came equipped with one option, the Navigation System Package ($2,295). The AWD and CVT transmission are the only options available for the SE trim level. If youâ€™re looking to go sportier, you will want to opt for the GT version which comes with a few more goodies, including foglights, sporty front fascia, leather-wrapped steering wheel and shift knob, shift paddles, auto-dimming rearview mirror, the Fuse voice-activated electronics interface, color driver information display, Bluetooth and six-speaker sound system, among a few others. Standard equipment includes the usual in a compact sedan, such as Air conditioning, multi-information display, dual front cupholders, steering wheel-mounted cruise and audio controls, drive mode-selector, ABS with EBD, Eco driver indicator lamp, d6d0/40 split-fold seats, 60-way adjustable driver seat, height adjustable steering column, heated front seats/sideview mirrors, power door locks, windows and sideview mirrors, remote keyless entry, floormats. The SE models are also pre-wired for Bluetooth. Halogen headlamps are standard on the SE version, and chrome accents added to the front grille and lower front grille add a little sportiness. Mitsubishiâ€™s front end takes a little getting used to, featuring a more squared-off look. 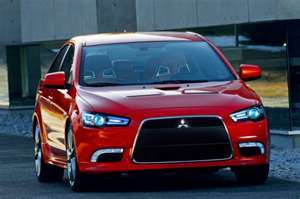 The 2012 Lancer is a tad more aggressive and edgy than past models, bringing its look more up-to-date. With competition the likes of Ford Focus, Hyundai Elantra, Chevrolet Cruze and Mazda 3, Lancer pales by comparison, and doesnâ€™t produce the fuel economy the others do. We would recommend Mitusubiishiâ€™s 2.4L I4 over the base 2.0L. Warranty: 10 yrs/100,000-mile powertrain; 7 yrs/100,000-mile anti-corrosion perforation; 5 yrs/60,000-mile bumper-to-bumper; 5 yrs/unlimited roadside assistance. Although some have named Lexus CT 200H a â€œgood value,â€ weâ€™re not sure we are in agreement. At $30,000 it may be; at a total vehicle price of $38,000, it wouldnâ€™t make our list. A premium-compact vehicle, the 200h gets notice due to its high fuel economy ratings, sports handling and pricing. Itâ€™s also been called â€œBest in Segmentâ€ with a driver-friendly cabin and superb ergonomics. The ride in the Lexus CT 200h is smooth, yet bottoms out when navigating rough roads. Seating is comfortable and body-fitting. The driverâ€™s seat is a 10-way multi-adjustable power seat so drivers of all sizes and shapes will most likely find a comfortable driving position. Our test 200H came equipped with a Premium sound system, a package price at $1,100 and including 10 speakers, and in-dash 6-disc CD changer. Also included in the sound system package are auto-dimming electrochromic rearview mirror and Lexus Homelink Universal Transreceiver. The other options on our test 200H were LED headlamps with auto leveling and headlamp washer combination ($1, 215), Leather package (perforated leather seats with driver seat memory, rain-sensing intermittent wipers with mist cycle, auto-dimming outer mirrors with memory ($1,330), Navigation system (HDD Navigation System Backup Monitor, Lexus Enform with Destination Assist and eDestination with 1-yr trial subscription; Lexus Insider, Voice Command, XM NavTraffic, XM NavWeather, and XM Sports & Stocks (90-day trial) at $2,445, and Cargo net ($75), and illuminated door sills ($299). Quite a few expensive options that take this little Hybrid Lexus to hovering just under $40,000. Safety equipment on the 200H abounds, as expected. ABS, with Electronic Brakeforce Distribution (EBD), Brake Assist, Vehicle Stability Control, Traction Control (TRAC), and Electronic Throttle-Control System (ETCS); Smart Stop Technology, Curtain airbags, supplemental restraint system, passenger knee airbags, front side impact airbags, side curtain airbags, supplemental restraint system and Safety Connect with Automatic collision notification, stolen vehicle location, emergency assist button (SOS),and enhanced roadside assistance (1-yr. trial), and LED running lights. Some of the standard equipment on the 200H includes carpeted floor mats, Lexus personalized settings, Tunneau cover, XM Satellite radio, USB input/Miniplug auxiliary input for MP3 player, tilt/telescoping steering column, 4-Mode drive mode select, SmartAccess with Push-Button Start/stop, and of course, our least favorite feature: the audio controls on the steering wheel. Warranty: 4 yr./50,000-mile Basic; free maintenance; 6 yr./99,9999-mile Rust; 4 yr./99,9999-mile Roadside Assistance; 6 yr./70,000-mile Drivetrain.